The Motorola Configuration demonstrates a multi-plant installation. 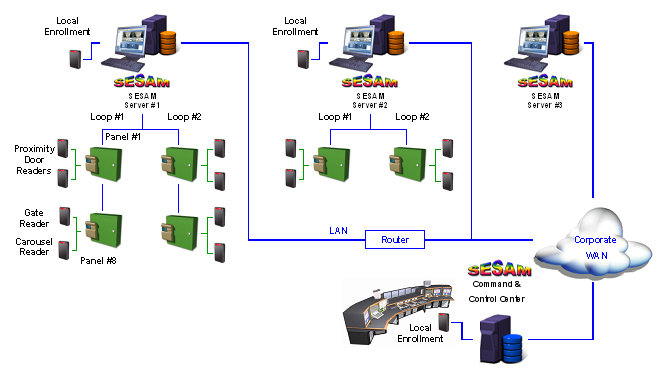 Each plant has a SESAM unit connected to the access control system; 2 Access control loops. In each loop there are 8 controllers, with 16 readers in each loop. The Enrollment reader is also connected to each SESAM Plant unit.Thus tags can be issued to the cardholders from various locations. The data are gathered from the different plants and transferred through a router to the Corporate WAN, and finally to the Command and Control Center. At the Command and Control Center there is also an enrollment position, which allows uploading cardholder data to the controllers distributed throughout the different plants.